Thank you for joining me as we count down to the next MFT release. We are six days away from the big day! All the new Stamps, Die-namics, and Stencils will be available on Tuesday, October 14th at 10:00pm EST. Be sure to check out the MFT Blog to see all the new items being revealed today. Don't forget to leave a comment on the MFT Blog Countdown posts, YOU could win one of the seven $75.00 gift vouchers. I have a couple of cards to share with you today, the first one features the gorgeous Snowflake Fusion Cover-Up Die-namics and the Peace, Love, Joy Die-namics. The pierced details in the Snowflake Fusion Cover-Up is stunning! I die-cut a piece of Smooth White card stock with the Snowflake Fusion Cover-Up and I layered it on top of another piece of Smooth White card stock. Since the Smooth White card stock is fairly thick, I used the Metal Adapter Plate along with the normal cutting stack. 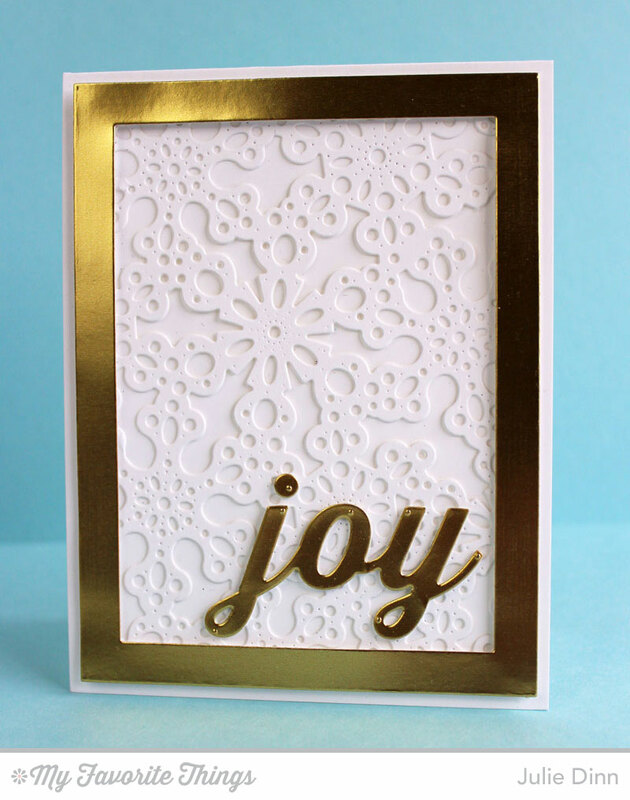 The Rectangle Frame Die-namics work wonderfully well with the our Cover -Up dies. The one I used here was done with Stampin' Up's Gold Foil Sheet. The word Joy was also die-cut from the same card stock. I added a 3D Foam Creative sheets to the back of the card stock before I ran it through the die-cut machine which helps to raise the sentiment off the white card stock. I kept the inside of the card fairly simple. 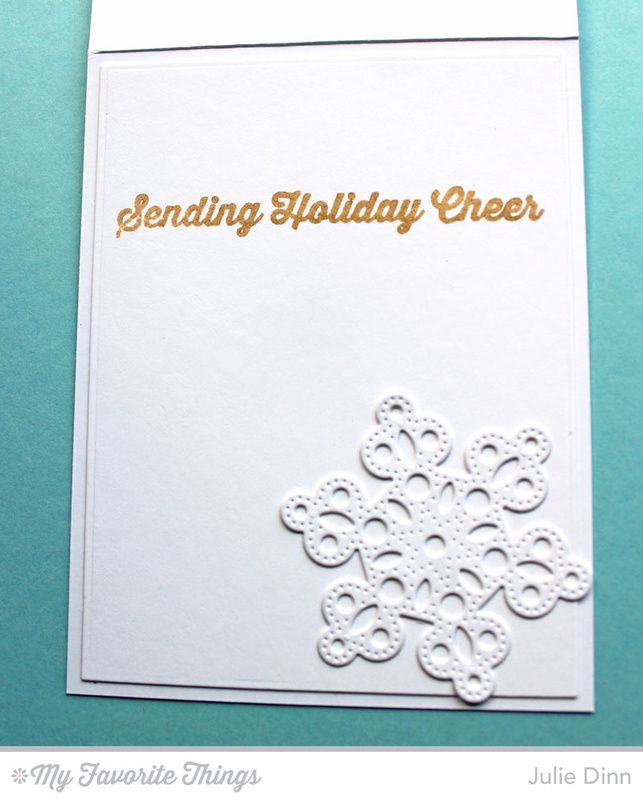 A gold stamped sentiment from the Merry Messages stamp set and a gorgeous Pierced Snowflake. My next card features a few more of the fabulous new products, the Merry Die-namics, and the Jingle All The Way stamp set and Die-namics. The new Merry Die-namics is such a fun die to work with. It is sized to work either vertically or horizontally on an A2 card. Of course, I had to see if it would work on a diagonal too, and it did! Before stamping the background, I masked off the work Merry with a couple of post it notes as I wanted it to stand out on the Berrylicious card stock that I tucked behind the front of the card. This dancing Santa looks like he may have been into the jingle juice! :) I stamped him on a piece of X-Press It card stock and I coloured him with Copics. For that extra sparkle, I added a little bit of glitter to his hat. On the inside of the card, I added one of the may fun sentiments from this set, and a snowflake filled Vertical Stitched Strip. Thank you so much for joining me today. 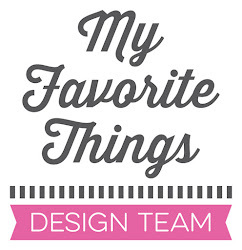 Be sure to check out the MFT Blog to see what the rest of the design team has to share with you. Great cards...so elegant an super cute!! What great cards, I love the new Merry Dienamic. Your first card is so lovely and elegant. Love it. The second card is so fun and happy, just what a Santa card should be. :) Terrific cards, Melody! Great cards! The bright and bold merry looks amazing! Two different styles, both stunning! That's what I love about all of you designs versatile and always perfect! 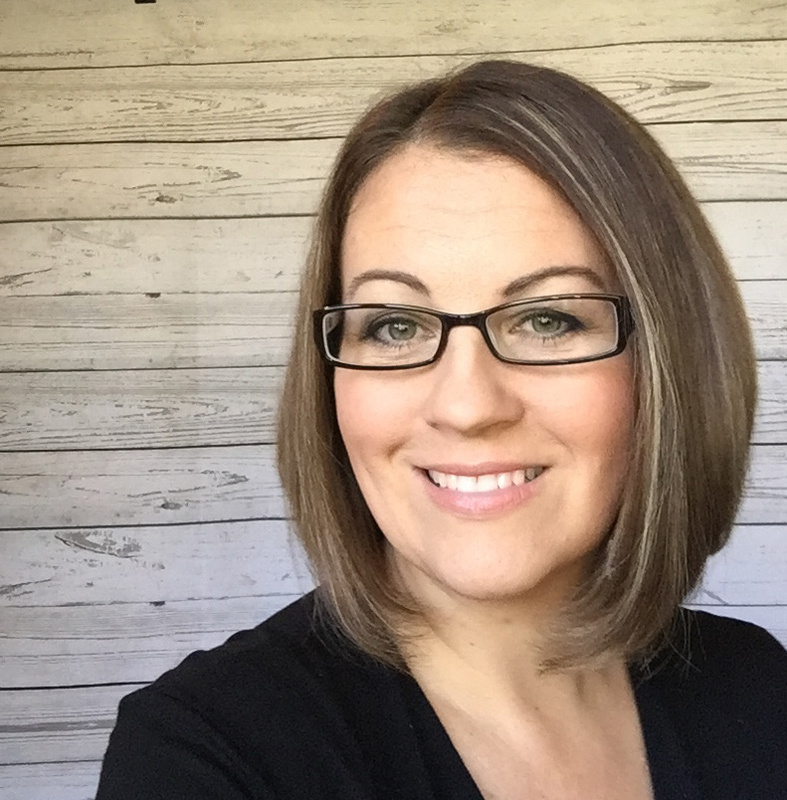 Love these new products! 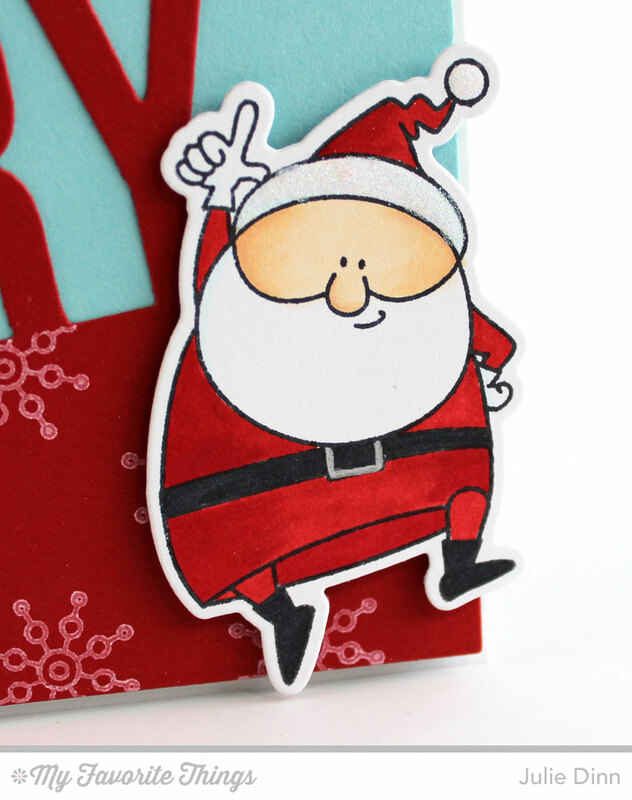 Love how you used the Cover-Up die, and the Santa card is adorable! great cards, love the gold and white, the fun Santa and everything. TFS. There's that adorable Santa again! I love the snowflakes, too - beautiful cards. Hey, that 'merry' is totally cute!!! Love these both! Great cards. love the White and Gold (simple but elegant). The Santa card is just so fun! Love all of your cards! Beautiful! I love all of the cards but the "Merry" is awsome! I love it! thanks for adding pin buttons, I pinned them! That gold and white card is so elegant! Thanks for sharing. Love the gold frame and the layout on your Santa card. Anything from Jingle All the Way causes me to smile. I sure like the look of the Merry die-cut on the tilt. Great job. Your first card is so elegant & the second is so much fun! Your santa card is too cute!! Love the choice of colors, and that Santa just makes you smile!! Great cards...lovely and so very cute!